Bush Doesn't Fault Obama For Playing Golf : The Two-Way President Obama has been criticized for playing too much golf. But former President George W. Bush tells the Golf Channel that the sport is a good outlet for the pressures of the White House. 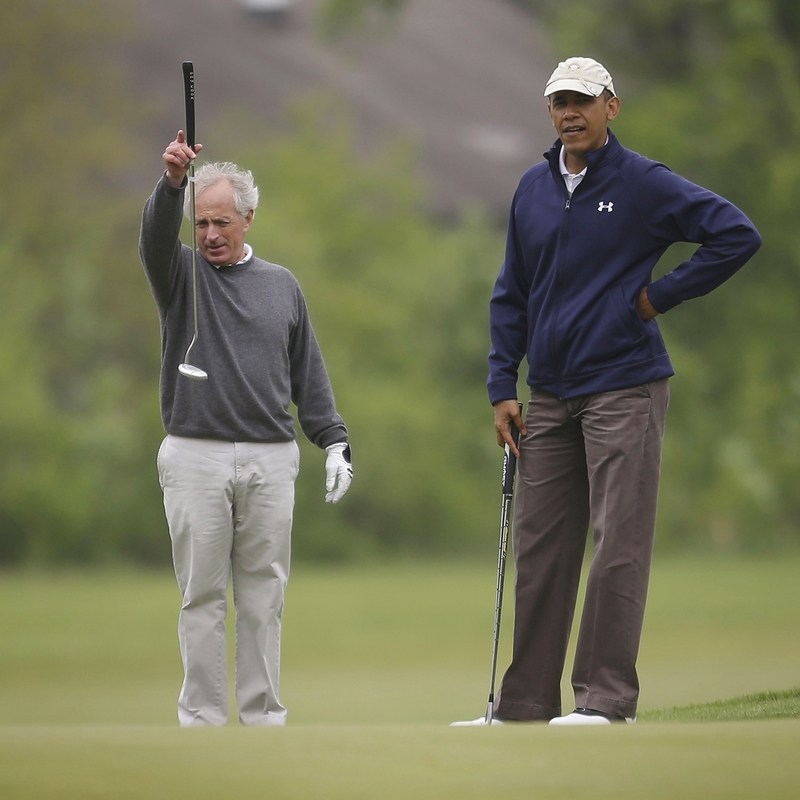 President Obama (right) with Sen. Bob Corker, R-Tenn., on the first hole of the golf course at Andrews Air Force Base on May 6. President Obama seems to enjoy playing golf, but he's been criticized for spending too much time on the golf course. Obama has played more than 140 rounds of golf since he first took office, according to CBS News. He's even played with Tiger Woods. Obama's not alone — 15 of the past 18 presidents played golf while they resided in the White House. Former President George W. Bush hit the links, but after two and a half years in office he stopped playing. He said the commander in chief shouldn't be seen on the golf course while Americans were dying in Iraq and Afghanistan. But Bush doesn't criticize Obama for playing. In an excerpt from In Play With Jimmy Roberts, airing Tuesday night on the Golf Channel, Bush says golf is a good outlet for the pressures of the White House. In addition to having presidential libraries, two former presidents are in the World Golf Hall of Fame: Dwight D. Eisenhower and George H.W. Bush.